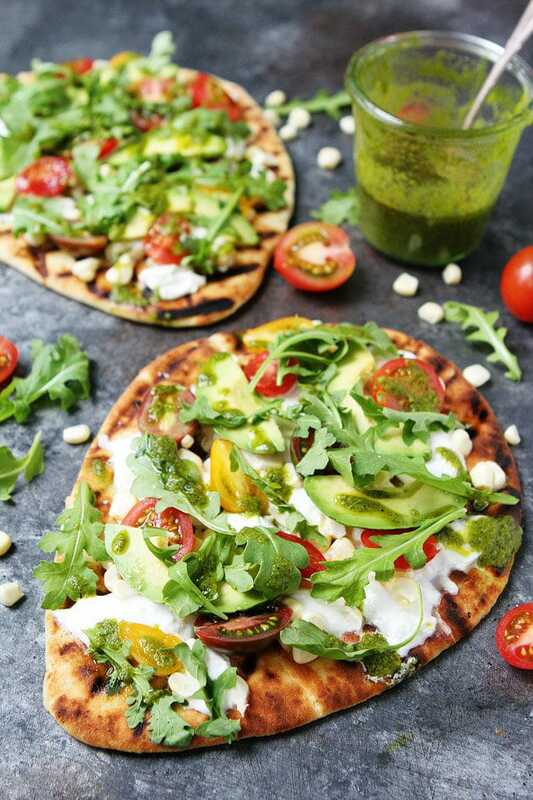 Tomato, Avocado, and Burrata Flatbread-grilled flatbread topped with burrata cheese, tomatoes, avocado, corn, and a drizzle of basil vinaigrette. 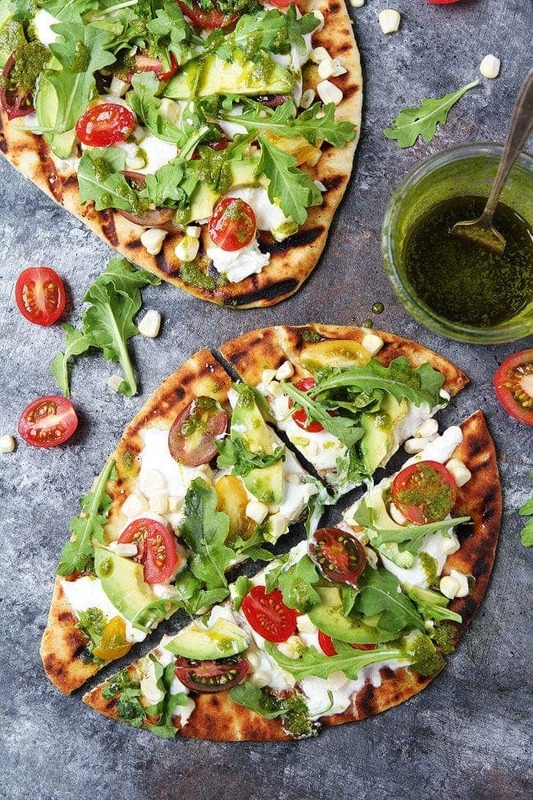 This easy grilled flatbread pizza is a summer favorite! Grilled pizza is the BEST and one of our favorite summer meals. Sometimes, we don’t have time to make pizza dough from scratch so we cheat and use store bought flatbread. 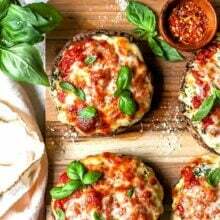 Flatbread pizzas make a great quick and easy meal and they are always a hit. 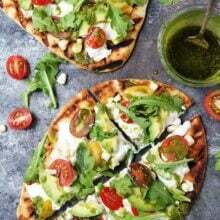 This Tomato, Avocado, and Burrata Flatbread is one of my favorite pizzas and it takes 15 minutes to make. Buy naan bread from the store. You can make it from scratch, but we are all about keeping it easy. Brush both sides of the naan with olive oil. Place on a hot grill and grill on both sides until bread has grill marks, about 5 minutes. Remove from grill and top with your favorite pizza toppings. Buratta cheese pizza is SO good because it is soft, creamy, and melts on the warm flatbread. The tomatoes and sweet corn are the perfect summer toppings and avocado because it makes everything better. The arugula adds a peppery bite and makes the pizza extra pretty. The drizzle of basil vinaigrette is a MUST. Don’t skip this step. 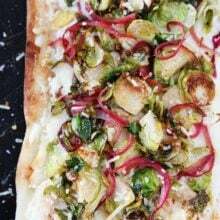 I keep basil vinaigrette in our fridge all summer long because it always comes in handy and tastes good on everything, including this flatbread pizza. If you don’t have a grill, you can make this pizza in the oven. It will still be super tasty! This pizza is great for lunch, dinner, or served as a party appetizer. You can’t go wrong! If you are in the mood for pizza, but don’t want to make it from scratch, make this easy Grilled Flatbread Pizza! It only takes 15 minutes to make and is MUCH better than ordering pizza. Enjoy the flavors of summer while you can! This easy grilled flatbread recipe only takes about 15 minutes to make and makes a great summer appetizer or meal! Lightly brush naan with olive oil on both sides. Place naan on hot grill and grill for 3-5 minutes, flipping once half way through, or until the bread has grill marks. 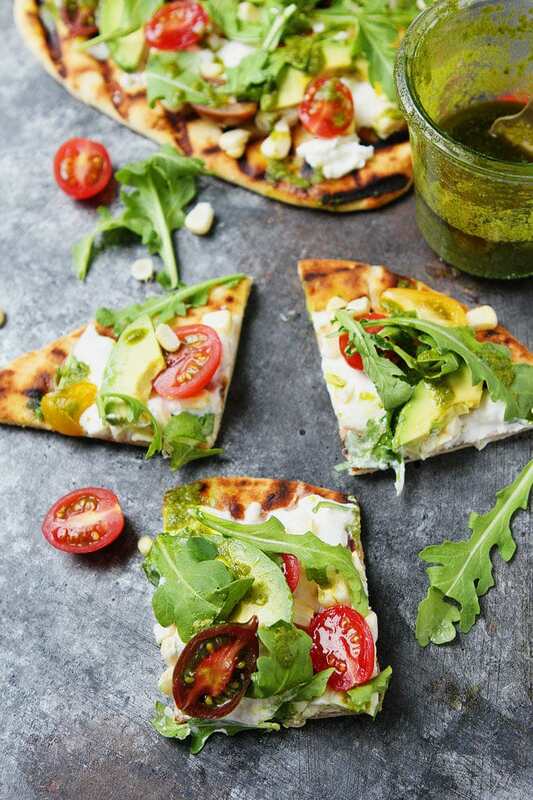 Cut burrata into chunks, and place onto warm flatbread. The cheese will start to melt. Top with tomatoes, sweet corn, avocado slices, and arugula. Drizzle with basil vinaigrette and finish with salt and black pepper, to taste. Note-you can also make this flatbread in the oven. Preheat oven to 400 degrees. Heat the naan in the oven for about 5 minutes or until warm and slightly toasted. OMG yum! I am obsessed with grilled naan and burrata! 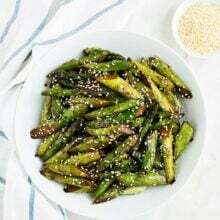 Such a perfect Summer dish!! I’m all about cheating on homemade crust if burrata is involved! The best kind of cheating! This is TOTALLY my kind of food, and burrata..come on. Love! YES! This is like my most favorite trick – store brought flatbread/naan makes the most amazing grilled pizza. Love that this is also like a pizza and salad in one! YES! 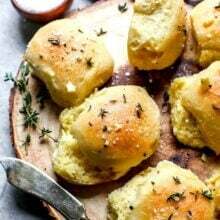 these look so good and wonderfully easy! The perfect way to keep enjoying summer!! All of my favorite things! I love making naan pizzas – so much easier than pizza dough! 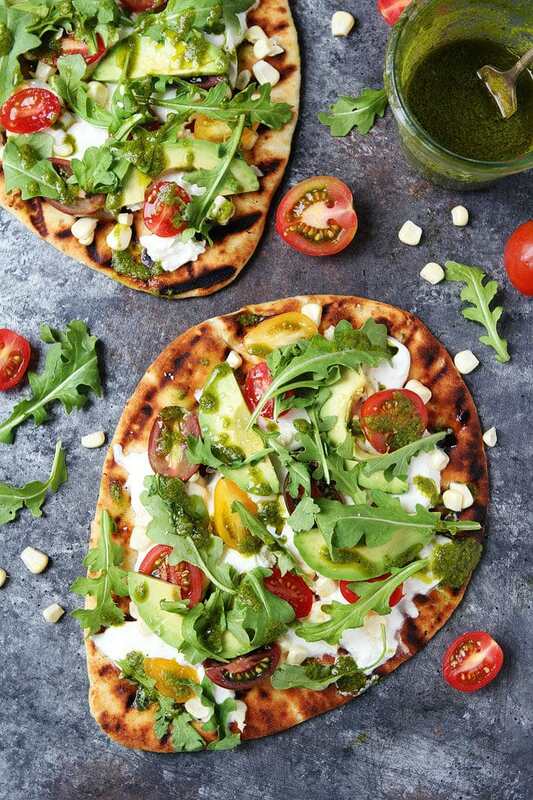 Always appreciate burrata incorporated into any recipe since it’s so rarely featured, great idea with naan flatbread with all of these other wonderful flavors, love it and thank you! I’m all for 5-minute meals…and pizza, but that was a given! It’s been so freaking hot in Portland lately, but once it cools down, I can’t wait to make this! It looks delicious! Wow! Was this ever delicious, and so easy to make too. This is definitely going to be on the menu at the cottage this summer. Thanks for a great recipe!